Today I’m talking about the power of play and community with two dear friends, Ali Leipzig and Michelle Goldblum, founders of Soul Camp. I have taught and participated in Soul Camp in the past, and it has really had an impression on me. 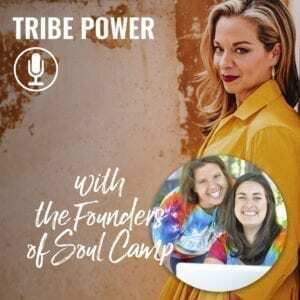 As the world changes, so does Soul Camp – the activities, the kinds of connections people are seeking, and so much more. This is the last year of Soul Camp East the way it has been, so if you have ever thought of doing it, now is the time! And I truly recommend it. Soul Camp is an amazing experience that offers a real feeling of oneness and deep connection with your community. Listen in to hear what Soul Camp will be like this year and the healing powers of this summer camp for grown ups. Claim your spot at Soul Camp East and check out Soul Camp West!